Have you seen the latest T-Mobile Life’s for sharing advert? Well if you have – I was the person who had the daunting task of delivering 160 channels of working hand held radio microphones in central London. 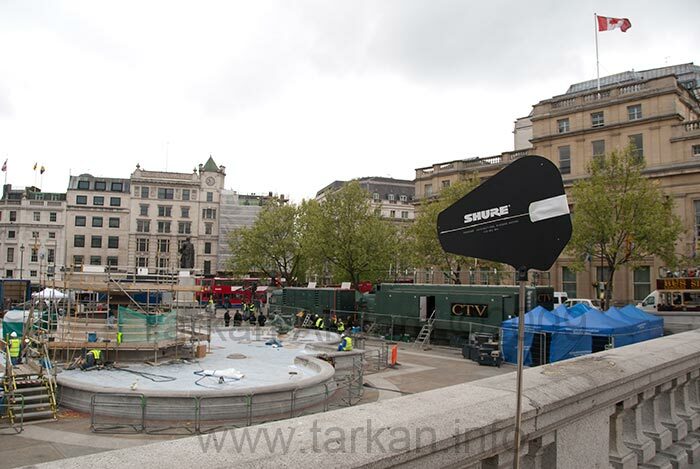 The production company (Partizan) approached me with this small task – 160 channels of radio microphones all working at the same time in central London outdoors in Trafalgar square for a giant karaoke. 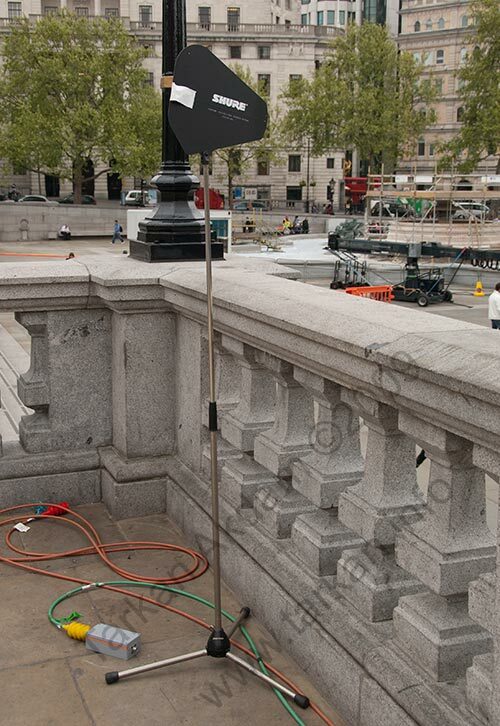 So the first problem – Trafalgar square measures around 105m by 60m (coverage area required), consider that your average radio microphones maximum range is only 40m – with line of site to the antenna in perfect RF surroundings with no other transmissions, once you add in a few radio mics realistic range is more like 20 to 30 meters – don’t forget having huge crowds also attenuates your signal so expect the range to drop down to 15 to 20 meters. Next up was the shear number of radio microphones – 160 channels of radio mic operating in a single location. Most people who use radio mics will tell you anything above 40 channels starts getting complicated. So to get this many working – frequency planning would need to be critical and huge amounts of bandwidth would need to be reserved and licensed. 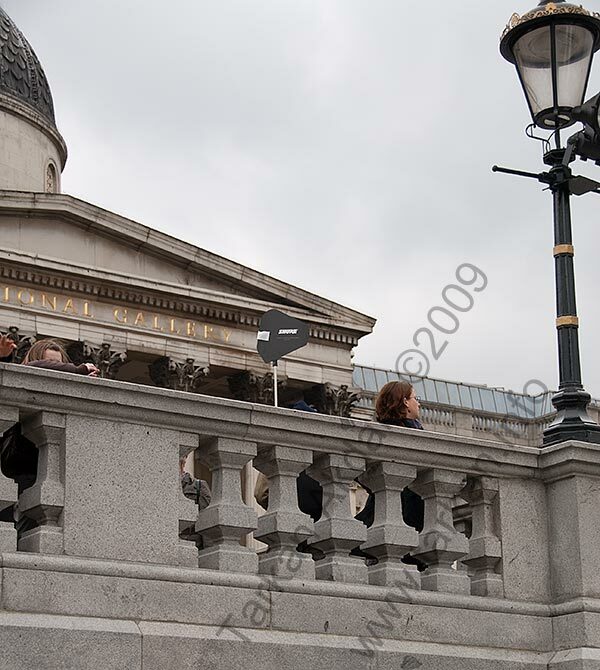 All the other radio frequency users would need to be taken in to account – central london has a busy RF landscape including TV transmitters and west end theatres, and being outdoors does not help as you are totally exposed to external interference. Also not to underestimate the site generated RF – high power comms / walkie talkies and the numerous analog and digital hi-def wireless camera links….. So you get the picture this is a serious challenge and unless someone tells me otherwise this is a world record for the number of radio mics used simultaneously in one location. Equipment choice was easy – there is currently only one system which I felt comfortable with that would be capable of doing this – the Shure UHFR – it has been on the market around 3 years so it is using modern RF technologies and it is available in several frequency bands. Having the good fortune of having an early prototype several years ago and using production models ever since, meant I was very comfortable with the ability of the system. Using digitally controlled course and fine tracking filters each receiver can cover 60Mhz with excellent intermodulation rejection and front-end sensitivity – exactly what I need. With the tracking filters ensuring that the receiver is not overloaded or swamped by out of band signals. Even so Shure rate the UHF-R as capable of running 40 channels in each band – and I would be pushing this limit. With this quantity of radio mics we needed to sub-hire lots of channels to make up the numbers but also to get a good spread of frequency bands. Some of the bands are not used in the UK much so we obtained some from Europe with assistance from Shure (Germany). So once the number of systems from each band was set I could start my frequency planning – I decided that I would need everything that was available (TV channels 27 to 69), covering frequencies 518Mhz to 865Mhz. JFMG kindly block reserved out all frequencies for my sole use on that day – giving me the time I needed to work on a frequency plan. Obviously my planning needed to take in to account of all digital and analogue TV transmissions and other known RF transmissions, so the final plan does not occupy that whole range as several channels were avoided. With so many systems operating even the smallest of rogue transmissions had the possiblity of throwing everything out..
On the day we would have to be vigilant for rogue ENG crews using their own radio mics (most likely occupying TV channels 68 and up), with such tightly planned frequency use even a single out of plan radio mic could have caused issues across 10 or more of my microphones. To complicate things further the production company introduced an artiste – Pink, who wanted to use her own Sennheiser SKM2000 radio microphone – so now I was planning for 162 channels of radio microphone, with 2 extra frequencies for Pink’s microphone – one used as a spare in case of on the day interference. If one microphone had to work on the day that would have to be the artistes’. After creating several frequency plans I finally settled on a plan I was happy with and one which passed all the situational tests I created to take in to account how the microphones would be used and their physical location to one another including predicted distances from antennas. My frequency plan attempted to minimise intermodulation and maintain maximum frequency seperation between transmitters with additional protection for the frequencies used by Pink’s mic. Even so I still averaged 9 microphones on some TV channels which given the numbers involved is pretty impressive. My final frequency plan was not as intermod safe as compared to what I normally plan in use at stadium gigs or theatre. For this event transmitter frequency spacing was slightly more important then the best intermodulation performance, I would have to deal with intermodulation in other ways. The antenna system would really make or break what I was attempting. Regardless of how great the frequency planning was (and it was great!!) with this many transmitters in one location intermodulation is a problem. The problem with intermodulation is that every additional transmitter causes the issues to go up exponentially. 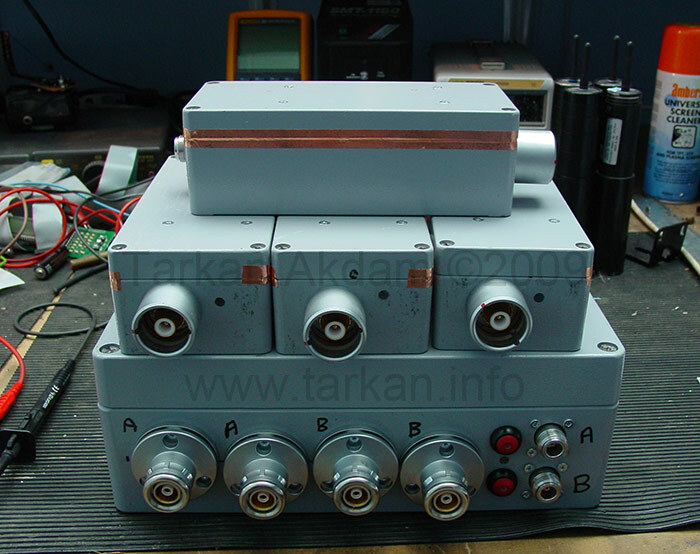 The closer the transmitters get to one another larger the intermod gets – increase the received signal by 3db (2x) the received intermod goes up 9db (8x). This is an extremely complicated area when it comes to radio frequency use which is also made worse by how different receiving equipment deal with it. So what I had to design was an antenna system which would amplify the rf signals I want – give me enough gain to cover the whole of Trafalgar square while keeping the intermods and other interference at a level which would not cause me problems – a balancing act!!! My first thought was to saturate the coverage area with antennas – around 8 pairs of antenna with low gains – so as to minimise intermod issues but still give me enough coverage. I decided against this as I would need loads of cable runs and this many antenna could have caused all sorts of problems, including how they would react with microphones bunching up near them. My calculations showed that the minimum and maximum distances from antenna to transmitters would be too great, so nearby transmitter induced intermod would have knocked out far-away transmitters. Not to mention that all these antenna would look ugly on camera. I opted to go for a 4 way antenna system – one antenna in roughly each corner of the coverage area, much more discreet and better area control. My antenna choice was the Shure directional wideband passive paddles (PA805) with a forward gain of around 7db covering an angle of around 100 degrees in the forward direction. I would still need more gain so I designed and built a 4 way head amp system. My system comprised of 4 head amps which were powered via the RF cable from the Power Supply / Combiner unit. The head amps have low noise high gain amplifiers giving me 30db of gain with extremely high headroom – so the amplifier stays in the linear region (good for intermod). I designed it to for wideband use so it covers 500Mhz to 1000Mhz frequency range, I used some extra attenuation and filtering in the headamps to suit this events particular nature. The head amps and power supply unit are interconnected via Triax cable – I use Triax cable as it is double shielded which really helps reduce any cable induced RF noise, especially when you have combined cable runs over 400meters long across a busy site. It is still a lossy cable but I had more than enough gain from my head amps to overcome this and still maintain a low noise floor. The output from my headamps were then put through an array of 21 Shure UA845 ADA units to feed the 80 dual Shure UHF-R receivers and one Sennheiser SKM2000 receiver (for Pink). On event day, I placed two Shure active wideband antenna (UA870) on top of the OB truck parked next to us and focussed these on to where Pink would be performing – this was to ensure coverage for her microphone and provide some in-fill coverage for the other mics. It is one thing looking at RF signal levels when the place is empty and another thing when it is full with over 13000 people – the human body is great at blocking RF signals not to mention the people who insist on holding microphones around the antenna!! !